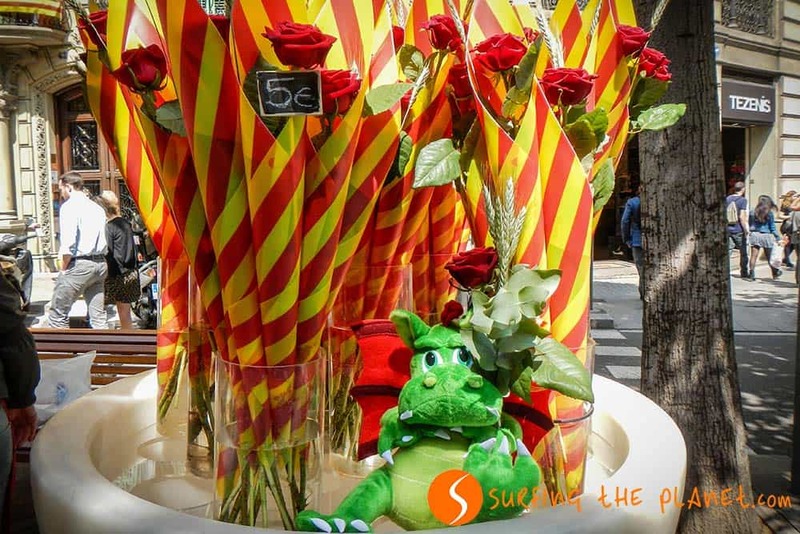 23th April is the day of Sant Jordi (Saint George), one of the most popular festivities in Barcelona and the rest of Catalonia. It’s peculiar that this day actually is not a public holiday, but if you walk around the city center and see the amount of people on the street, you will find it hard to believe that. If in our last post we talked about the “calçotada”, that is, the typical way of saying goodbye to winter in Catalonia, now we’ll show you how they celebrate the arrival of spring. 2 What is celebrated in the day of Sant Jordi? 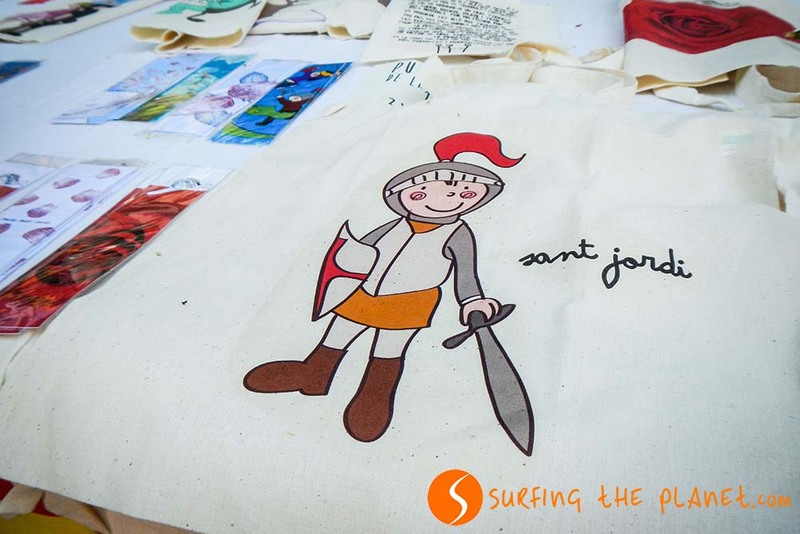 The legend of Sant Jordi is known all over the world. Once upon a time there was a dragon living in a village (the name of which is different in all countries). This dragon always wanted to attack the kingdom and in order to make him stay away, they offered him sheep to eat. However, after a while there were no more sheep to feed him and they decided to feed the dragon with people. The person was selected in a draw, and destiny wanted that the princess to become the next victim given to the dragon. This was the moment when Jordi, the soldier intervened and killed the dragon saving the princess from him. From the blood of the dragon a rose was born, which is the symbol of this day. 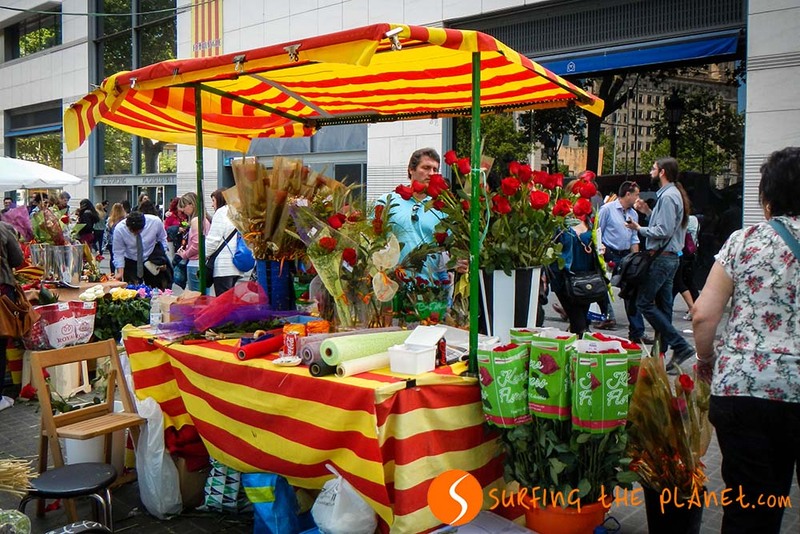 What is celebrated in the day of Sant Jordi? In Catalonia Sant Jordi is the patron of the people in love, here this day is much more celebrated than Valentine’s day. According to the tradition those in love exchange a red rose and a book. Men gave one red rose accompanied with an ear of wheat to their beloved women (nowadays the rose can be of different color), and women gave a book in return. The celebration praises love, culture and patriotism at the same time. The rose symbolizes the exclusivity of love, the red color is the symbol of passion and the ear of wheat represents. fertility. 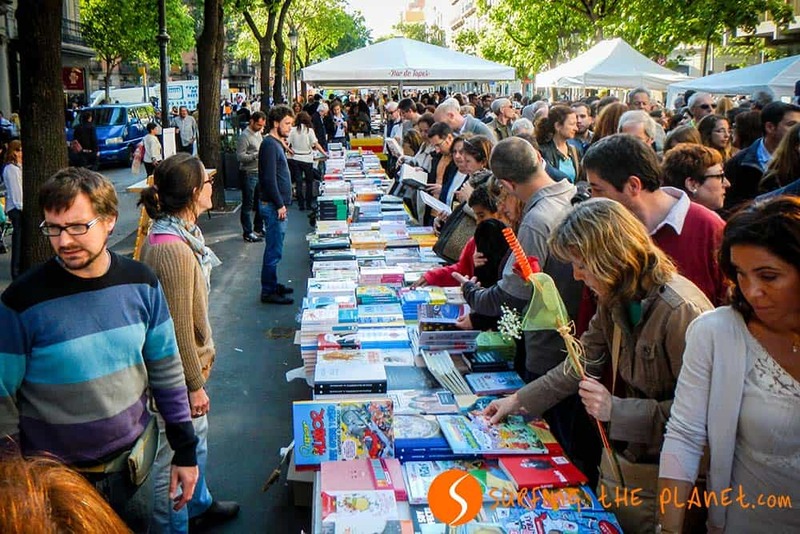 Barcelona “gets prettily dressed” on the day of Sant Jordi, you can find stands selling books and flowers in every corner of the city. The most popular places are the Rambla de Catalunya and Las Ramblas streets, which are very crowded during the whole day. They also organize cultural activities, several authors do book signing, and they also do book reading in many places. In the day of Sant Jordi culture and romanticism unite in one unique sentiment!! 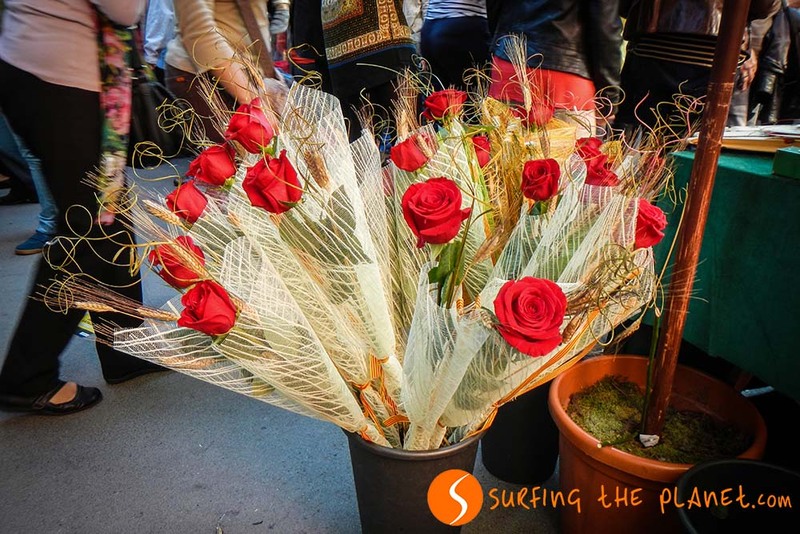 The day of Sant Jordi is definitely an awesome moment to visit Barcelona. 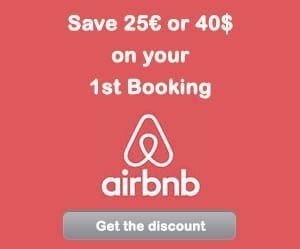 – ZZZ… BOOK YOUR HOTEL IN BARCELONA – find the best hotel for you. 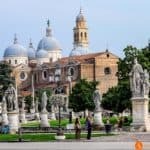 – FLYYY… Find the CHEAPEST FLIGHT TO BARCELONA . – BRUM BRUM… RENT A CHEAP CAR FOR YOUR TRIP TO BARCELONA – find the best car for you. How funny I had heard about St George slaying the dragon but never the rest of the story. What a lovely way to celebrate the day, looks like fun and not as commercial as Valentine’s Day has become. Yeah, it’s probably the most beautiful festivity in Catalonia! 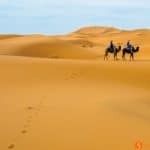 I was really glad to read your comment! Yeah, in the city center they might charge you that. If you buy the same rose with the same decoration, it costs usually 2 euros max.